Five individuals and two teams will be inducted into the Southern Illinois University Edwardsville Athletics Hall of Fame Class of 2016 on Saturday, Sept. 10, in Morris University Center’s Meridian Ballroom. This year's honorees include Dr. Robert Bruker (special recognition), Ed Huneke (men's soccer head coach), Matt Malloy (men's soccer), Tom Ritzheimer (baseball) and Nancy Swain (women's basketball/softball). The teams inducted this year are the 1977 baseball and men's soccer team. 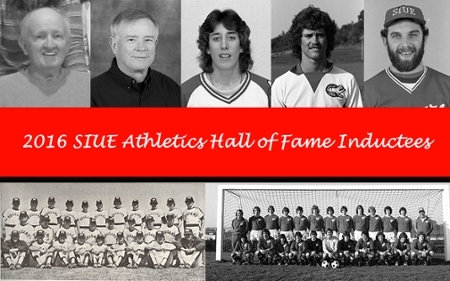 This is the 12th class to be inducted since the SIUE Athletics Hall of Fame started in 2005. The Hall of Fame seeks to recognize the achievements of former student-athletes, coaches, administrators and teams who have participated in the intercollegiate athletics programs at SIUE, as well as to celebrate the history of the institution. For details on each of the 2016 inductees, visit siuecougars.com. Reservations for the event can be made by contacting SIUE Athletics at 618-650-2428. Tickets are $40 and include a social for the inductees to be held at 5:30 p.m. followed by the induction ceremony at 6:30 p.m. This year's event is presented by Cassens & Sons Dodge, Jeep and Chrysler and the Missouri Athletic Club. Photo: SIUE Athletics Hall of Fame class of 2016.